Additive manufacturing is ideal for creating highly complex, lightweight structures that would otherwise be impossible with traditional processes, especially when coupled with design tools like topology optimisation. Creating lightweight parts is a key imperative for many industries. In aerospace, for example, lightweight components can significantly reduce aircraft fuel consumption, while in motorsports they can radically improve race car performance. For companies looking to reap the benefits of AM to create complex, lightweight designs, one company may have found a winning solution. Award-winning startup, AMendate, offers topology optimisation software for additive manufacturing. The software aims to make the design optimisation process as simple as possible. We spoke with AMendate’s Co-Founder and CEO, Thomas Reiher, to learn more about AMendate’s software, the design challenges it aims to solve and the increasing value of advanced design tools for additive manufacturing. Could you tell us a bit about AMendate? AMendate offers a fully-automated design optimisation software solution for additive manufacturing. 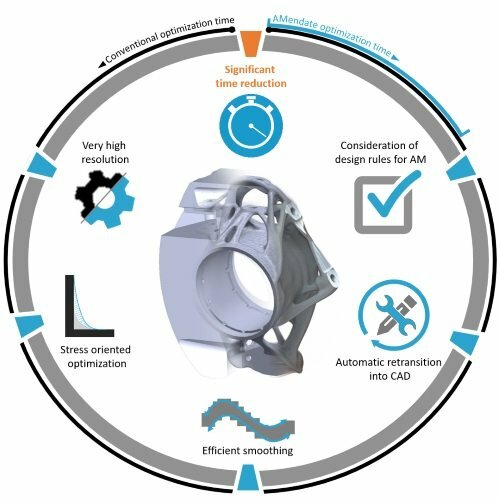 While additive manufacturing offers the possibility to produce lightweight designs cost-effectively, the design process is still highly complex. To solve this problem, my co-founder, Steffen Vogelsang, and I developed a new method for digital design optimisation during our work at Paderborn University. We’d been working on the idea for more than four years before developing a fully functional technology that has drawn the attention of several companies. Based on this early success, we decided to continue with the project full-time and launched our start-up, AMendate. Why are tools like topology optimisation and generative design so crucial to the additive manufacturing process? The ability to design lightweight parts is becoming increasingly important across industries, with aerospace and automotive being just 2 examples. In order to maximise weight savings, topology optimisation software is used to generate very complex part designs – which are a perfect fit for additive manufacturing. Generative design is the next level in this context: a large number of different optimisation approaches are generated and briefly calculated by automatically varying different parameters. The user can then select the most promising one and have it fully calculated. With AMendate, all of this is possible in a very short amount of time. Could you take us through the challenges that your software tackles? It’s virtually impossible to make complex components with a conventional approach to design. While a number of software solutions for design generation do exist and are currently on the market, there are limitations to their capabilities. They’re very time-consuming to use, for example. They also lack full automation and the designs that can be created aren’t complex enough for real-life business challenges. To address these issues, we developed a software solution to enable the fully-automated optimisation of technical components. Our software helps you create organic-looking, lightweight structures and achieve greater material savings and an efficient, cost-effective AM production process. We believe that such a holistic design solution hasn’t been available until now. Ultimately, our software unlocks the creative freedom of additive manufacturing by automating the design process for high-quality and robust components. What benefits does AMendate’s software provide? One of the key benefits is the ability for users to quickly generate complex lightweight structures through automation. Traditionally, this process requires the effort of manually interpreting the simulation results. However, the core element of our software automates the interpretation process and converts designs into a common CAD exchange format. This allows the user, in a short period of time, to generate a component that can be used in a familiar technical data workflow. We significantly simplify and accelerate the process so that even companies without their own computing capability can optimise components quickly and cost-effectively. We’re up to 80% faster than conventional processes and can achieve average weight savings of over 40%. After the optimisation process is complete, the design is ready for manufacturing. How does AMendate differ from other topology optimisation solutions that already exist in the market? Existing conventional topology optimisation software is very laborious to use and has its limitations – something we learnt through our own experience of using a range of software. That’s why we decided to create something more user-friendly. 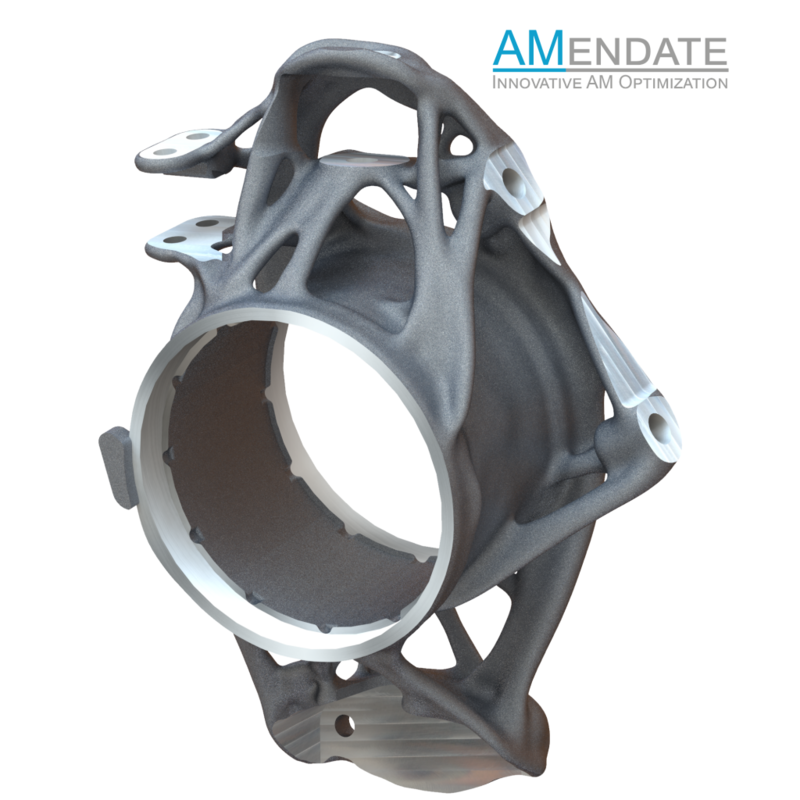 With AMendate, users can automate the process of generating meshes and interpreting the results as well as converting into CAD. This gives an engineer more time for higher-value tasks. Additionally, with other software solutions, you’d only be able to create simple organic structures that would need to be manually designed in CAD. On the other hand, our software creates better-optimised designs thanks to the automated results interpretation and file conversion. Automating this process makes us significantly faster than any other software. What are some of the obstacles to designing for additive manufacturing? Generally speaking, there are two key aspects that make designing for AM so difficult. The first is that existing software can’t exploit the full geometrical freedom of additive manufacturing. Second, there are still some design rules that need to be considered which are usually not integrated into the design software. This makes the design process complicated and prone to error. We try to avoid this with AMendate as the algorithm we’ve developed is capable of creating highly complex part designs that leverage additive manufacturing capabilities. With our design-for-AM module, we generate 3D-printable designs. How do you see additive manufacturing evolving over the next five years? Is there a trend you’re most excited about? I believe AM will increasingly find its place in complementing other manufacturing processes. How fast and to what extent this will happen heavily depends on the development of the hardware development and, increasingly, the software. Additionally, a new way of thinking about design for additive must still be sufficiently anchored in the engineers’ minds, and the corresponding CAD tools developed and made available. This is where we’d like to make our contribution: by adding a certain level of automation to the design process in order to truly enable and promote the benefits of using additive manufacturing. 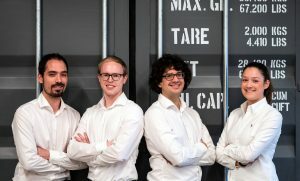 AMendate was announced as a winner of this 2018’s Formnext Start-Up Challenge. What’s next on the horizon for your company? The overwhelmingly positive feedback we received at Formnext gives us the confidence to further enhance our technology and produce a stand-alone software solution with a dedicated user interface. Over the coming months, we plan on using the momentum from the event to do just that. Additionally, we have a lot in our pipeline as we plan on further improving our functionality, speed and optimisation quality. Are there any final thoughts that you’d like to share with our readers? I think it’s important to stress how additive manufacturing has already challenged existing processes and ways of thinking over the last ten years. The technology really has opened up many new opportunities. We’re convinced that this is only the beginning and that the technological revolution will really take off in the next ten years. We’re excited to be involved in shaping this exciting development. To find out more about AMendate, visit: https://amendate.de/ or follow the company on Linkedin.